Wael Ghonim: Creating A 'Revolution 2.0' In Egypt The protests that led to the Egyptian revolution last year were organized in part by Wael Ghonim, who used an anonymous Facebook page to coordinate the demonstrations. In his new book, Ghonim explains how social media helped transform his country. One year ago, Wael Ghonim spoke with reporters in Cairo's Tahrir Square, as protests there continued. The protests that led to the Egyptian revolution last year were organized in part by an anonymous Facebook page administrator. When the police found out who he was, they arrested and interrogated him. 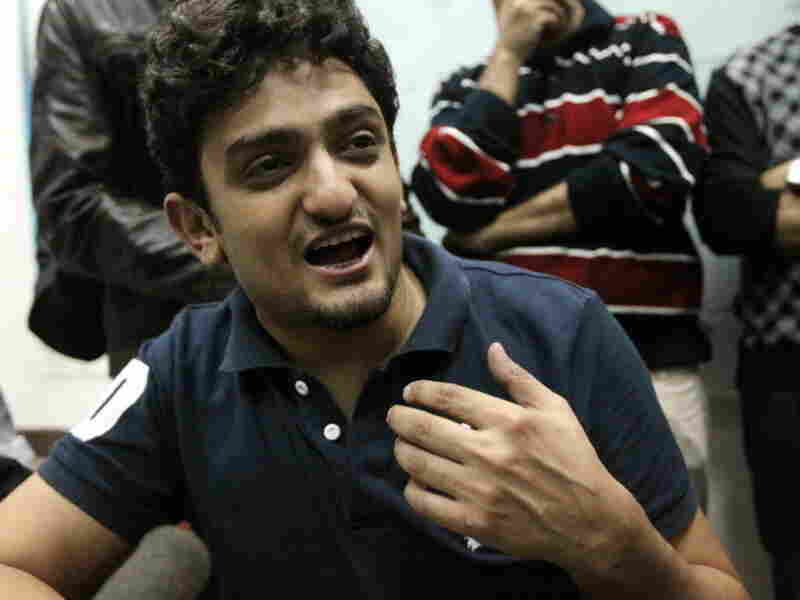 After his release, Wael Ghonim became the public face of the Egyptian revolution. 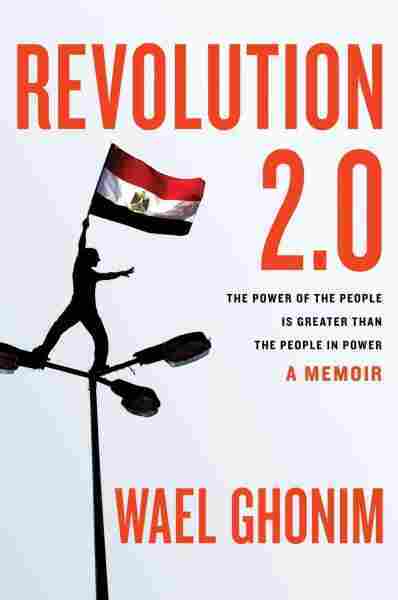 In Revolution 2.0, Ghonim traces the planning that took place in the days before Jan. 25, 2011, when thousands of Egyptians gathered in Cairo's Tahrir Square in preparation for the uprising. He also gives an insider's account of what he experienced during the protests — when Egyptian security authorities locked him in a basement jail cell — and then what it was like after the departure of President Hosni Mubarak. Ghonim launched his Facebook group, called Kullena Khaled Said ("We Are All Khaled Said"), after graphic pictures of a 28-year-old man who had been killed by Egyptian security officials began to emerge on the Internet. "Looking at Khaled's photo after his death, basically, I just felt that we are all Khaled Said. That was a feeling," he tells Fresh Air's Terry Gross. "It wasn't just a brand name. It was a feeling. We were all of these young Egyptians who could die, and no one [would be] held accountable. So at the time, I thought, 'I have to do something.' And I believed that bringing Khaled's case to a public case would be helpful." Ghonim's Facebook page anonymously called for accountability for Khaled's death and an end to corruption within the Egyptian government. "We [wanted] to expose the bad practices of the Egyptian police," he says. "Because the last thing a dictator wants is that you expose their bad practices to its people." The page engaged users, solicited ideas from Egyptians, and also proposed a Jan. 25 mass protest date. The Facebook group was set up through a proxy program in order to keep Ghonim's identity a secret. "I basically thought that my anonymity was my power, was the reason this page was so powerful," he says. "A lot of people believed in what was there." Right before the protests started, security officials in Egypt learned Ghonim's identity. They captured him early in the morning on Jan. 28. "I was walking out at night after having dinner with some colleagues, and I was on Twitter, walking, and all of a sudden I found three people surrounding me, one covering my mouth and the other taking my phone," he says. "I was looking around, trying to grasp what was going on, and I heard one of them say, 'OK, we're done, send the car.' So I knew I was getting kidnapped." For 11 days, Ghonim was held blindfolded in a cell and repeatedly interrogated. Egyptian security officials told him that they suspected he was working with foreign officials and called him a traitor. "It was a very hard moment for me," he says. "I would accept being seen as someone who is the opposition, who is creating problems for them — but the fact that they called me a traitor was very hard on me. I told them, 'You can torture me as much as you want, but you're not going to get this out of me because this is not true. I would prefer to die than to admit something I've never done, that I think is completely wrong.' "
Meanwhile, news began to circulate on the Internet about his disappearance. Activists on Twitter and Facebook began to coordinate efforts to find Ghonim. As he languished — unaware of the protests or what his fate would be — Google, his employer, started working behind the scenes to publicize his disappearance. His release on Feb. 8 was seen as a key moment in the revolution. Since then, Ghonim has been hailed for his energizing use of social media while planning the pro-democracy demonstrations in Egypt. He says sites like Facebook are tools that can help connect people and disseminate information to the masses, but cannot create social changes on their own. "We used all the available tools in order to communicate with each other, collaborate and agree on a date, a time and a location for the start of the revolution," he says. "Yet, starting Jan. 28, the revolution was on the streets. It was not on Facebook, it was not on Twitter. Those were tools to relay information, to tell people the truth about what's happening on the ground." "I was writing with my heart, not my keyboard. I was writing what I felt should be written." "On the 14th of Jan, when Ben Ali left Tunisia — when he escaped practically to Saudi Arabia — the whole Internet webosphere was talking about it. Egyptians were saying, 'We are worse than Tunisia. We have to do something. This is our moment.' And a lot of people had this belief. Being influenced by those people, I just wrote on the page, 'Today is the 14th of January. In 10 days, we have a police day. If 100,000 of us take to the street, no one is going to stop us.' And that was the beginning." "The regime labeled it as the Muslim Brotherhood revolution and said it was a revolution of extremists ... All of this didn't really work because people saw what was happening in Tahrir. And so, every political, social groups — males and females, Muslims and Christians — were taking to the streets and all demanding one thing: That this regime has to go." "I could see things going in the wrong direction and thought that the regime would use violence to get everyone back to their homes. On the 25th of January, they forced everyone out of the square. They used rubber bullets, water hoses, tear gas. They were using it excessively despite the fact that protesters were so peaceful. At that time, everyone was very peaceful and civilized. They were all chanting and singing and calling for the regime to end, and planning to spend the night with no violence. And the regime used violence against them." "I was happy to see people saying, 'We were against this, and then after seeing you, we are with the revolution.' A page was created for me afterwards calling on me to speak on behalf of the Egyptian people, and a quarter-million people joined after that interview. But, as you might have noticed, I did not agree to do that. I do not agree that we personalize a revolution. If I was against personalizing a cause, I would definitely be against personalizing a revolution. I would definitely say this was leaderless and it should continue leaderless, and no one should be taking the lead after all these people sacrificed their lives."